In a market saturated with futuristic shooters, Battlefield 1, DICE's newest offering in a longstanding franchise focuses on the past to bring something new to the table. World War I was described often as “the war to end all wars” because of the sheer scope of devastation left in its wake. Battlefield 1 takes the destruction, brutality, revolutionary machinery and enormous scale that made this war so historic, and condenses them into one of the most compelling and exciting first-person shooters to arrive this year. Besides its setting, one of the most striking differences between Battlefield 1 and much of its competition is how it approaches its single player component. Many shooter campaigns often feel forced or tacked on in order to appeal to a wider audience, but Battlefield 1 subverts this norm by presenting a series of heartfelt vignettes that provide insight into the human element of war. Over the course of its five engaging “war stories,” we hear tales of brotherhood, loyalty, and the atrocities of man. Each of the stories introduces the audience to a new set of memorable characters with their own perspectives on the war and effectively conveys the physical and emotional toll they endure. Though some of these stories are stronger than others, each one felt unique and offered a sampling of weapons and vehicles that may not be immediately available in multiplayer. They also allowed for a chance to experiment with alternative styles of gameplay, with a few missions relying heavily on stealth to most effectively complete certain sections. All of this kept the campaign feeling fun and manageable. The roughly hour-long stories were paced like brief but entertaining interactive movies, rather than one long narrative that felt exhaustive by the end. This is a problem that has plagued many modern shooters, and it was refreshing to see a game try something different, let alone be successful in doing so. But for many returning fans of the series, the campaign will bear little weight compared the multiplayer experience, which is as robust as ever in Battlefield 1. Across its five modes, there’s something for everyone here; from old favorites such as conquest, rush, and team deathmatch, to new ones like war pigeons and the ambitious operations mode. I found both of the new modes to be particularly impressive, and are welcome additions to an already substantial roster. Operations functions like an amalgamation of conquest and rush on a much larger scale, with a flare of narrative thrown in to give it an extra kick. Each “match” in operations is spread across multiple sections and can last up to an hour in some cases. War pigeons, on the other hand, takes an opposite approach, emphasizing close-quarters encounters on small maps, where each team fights to capture and release three “pigeons,” before the other. But regardless of the mode, the variety of distinct weapons and vehicles available to explore truly make Battlefield 1 come to life. The guns have a certain satisfying heaviness to them that made each time I pulled the trigger a rewarding experience. Unlike Battlefield 4, where choosing one gun over another often felt inconsequential, each weapon and item here has significant differences from the next and can suit a wide range of play styles. One example of this can be seen in Battlefield 1’s selection of sniper rifles for the scout class. Each has a unique “sweet spot” that determines the distance at which a single body shot will count as an instant kill. 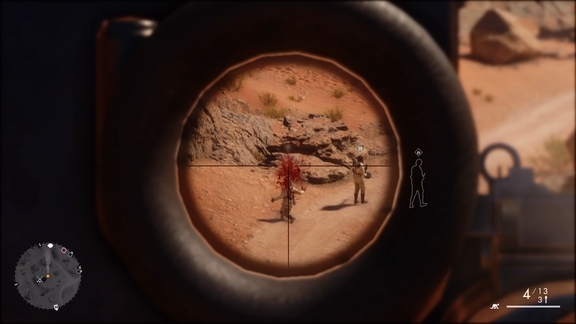 Therefore, those who favor long-range sniping would benefit from a rifle with a sweet spot that accounts for enemies who are far away, and vice versa. Though the individualism of each weapon makes the game more enjoyable as a whole, it does cause the system for unlocking the weapons to feel punishing at times. Everything in Battlefield 1 is unlocked via a currency called “war bonds,” which can only be achieved through leveling up. This would not be a problem if leveling was fast and efficient, but unfortunately, that is not the case. The leveling system rewards skilled players the most, where each action, from destroying armored tanks to simply wounding enemies, earns experience points. This means that being a proactive player who is able to secure a heap of kills or dominate objectives will yield the most points, and result in the fastest leveling. For relatively low-skilled players, however, this could make leveling up feel like a slow and tedious grind and would prevent them from earning war bonds to unlock weapons and items in a reasonable amount of time. As a result, I constantly second guessed my choices when I had to decide which weapons to unlock, and hoped the one I chose would suit my play style, knowing it would be a while before I could unlock another. Everything about Battlefield 1’s depiction of WWI is so intricate and immersive that at times it almost feels too real. From the impeccable map designs to the minute details like the clatter of bullet shells being spit from a gun’s chamber or the delayed thunderous boom of an airship dropping bombs onto a building in the distance, it all contributes to an overall sense of authenticity that permeates every aspect of the game. After its announcement, there were concerns that Battlefield 1 would simply feel like a re-skinned version of Battlefield 4 set in the early 20th century, but within the first few minutes of playing it, I knew it was just the opposite. It branches out from the pervasive trend of looking to the future of war and instead concentrates on the very beginning of the age of modern warfare in order to tell new and exciting stories. Though a sluggish leveling system prevents a consistent sense of progression, the stirring single-player campaign, and endlessly enjoyable multiplayer modes cement Battlefield 1 as a new staple in the first-person shooter genre, and prove that WW1 is just as captivating of a time period to explore than any imagining of modern or future eras. The hot swapping idea was absolutely perfect, and I hope to see it in future games. The multiplayer was good too, and needs to be expanded to further complete the game. In the end, if you want to take the great Battlefield series to your consoles, I certainly would recommend Modern Combat, as long as you don’t mind its lack of online play modes. It’s unfortunate that the artistry and vision that went into the narrative did not carry over to the rest of the experience.